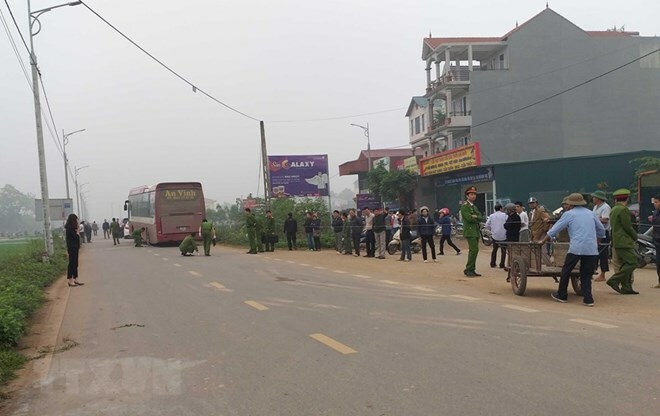 Vinh Phuc (VNA) - Seven people were killed and three others were injured on March 27 morning after a coach crashed into a funeral procession in northern Vinh Phuc province’s Yen Lac district. The accident happened at 5am on a road of Trung Nguyen village, Trung Nguyen commune, with the coach plowing into a group of pedestrians, killing five people instantly, while two others died later in hospital, said Hoang Van Hoan, chief of office of the provincial traffic safety board. The injured people are still under treatment in hospital and local police are investigating the accident, Hoan said. Deputy Prime Minister Truong Hoa Binh, who is head of the National Committee for Traffic Safety and Minister of Transport Nguyen Van The sent their condolences to the victims’ families. Binh instructed the provincial People’s Committee and relevant agencies to deal with the aftermath and organise drug tests for all drivers of transport businesses in the province. He also requested Vinh Phuc province to work with the Directorate for Roads of Vietnam to handle all potential traffic accident points on national highways and local roads in the province. Meanwhile, Deputy Minister of Transport Le Dinh Tho and deputy head of the National Committee for Traffic Safety Khuat Viet Hung came to the site to extend their sympathy to the victims’ families and directed the settlement of the accident.